Place au changement! – Place of change! 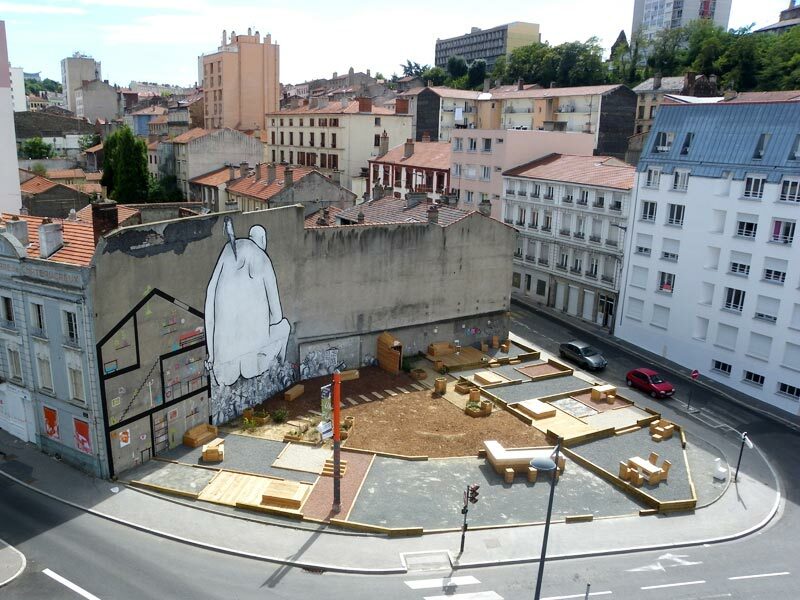 The Public Urban Planning Agency of Saint-Etienne (EPASE) launched a call for projects « Défrichez-là » to design a temporary public space located near the Châteaucreux train station and the Chappe-Ferdinand area. In March 2011, the Collectif Etc. won the competition. The Collectif Etc. aimed to initiate a collaborative process in the design of the public space. It also wanted to use the time of the construction site to meet and involve inhabitants in the project. The Collectif Etc. provided everyone tools, safety gears and advice. Local associations, artists and musicians were invited to organise various activities such as wall paintings, concerts, circus workshops, open air movie, sports, tournaments, tango lessons, special meals, debates… An online blog got set up and showcased the everyday life of the construction site. – The Public Urban Planning Agency of Saint-Etienne (EPASE) invites the Collectif Etc for the Biennale Internationale Design Saint-Etienne 2013. – The Collectif Etc launches a call for projects, aimed at collectives. – The Biennale Internationale Design Saint-Étienne. – Pauline Escot, graphic designer in charge of the project communication. – Malo Mangin, product designer in charge of projects installation. – The “Dames de Cote-Chaude”, organised an exhibition telling the story of the project. – Five collectives : BLOC Paysage, Grand Est, J’aime Beaucoup Ce Que Vous Faites, Total Clinche, and the Collectif Parenthèses. They all applied to the open call organised by the Collectif Etc. – Vincent Tuet, film director. – Laurane Ponssonet, Chief of urban projects, City of Saint-Étienne. – Inhabitants of the neighbourhood. – Users of the Chateaucreux train station. Answering the on-going urban changes in the neighborhood, the project simulates a first step of the process in which a building is designed and built. The role of design could be to make the potential of the site visible.The idea is to represent the plan of imaginary housings on the ground and their section on the wall. That way, people can imagine living in the future buildings and get an idea of the impact of the real one that should be built in a couple of years.